Now the question comes in mind that what kind of information is going to shared on Facebook? So the new WhatsApp update says that your phone number which you’ve used to sign up and the service you’ve used last time will be shared on Whatsapp. This could be quite disappointing because it debilitates your security. After getting some complains whatsapp soon realizes that their customer don’t wants some privacy and they don’t want to share their information including phone number on Facebook. Now, thanks to uninterrupted encryption, your messages, number, photos and everything is protected and will not be shared with Facebook. Only the person whom you are sharing your data with will be able to see your messages and your information will not be visible publicly to anyone using Facebook. 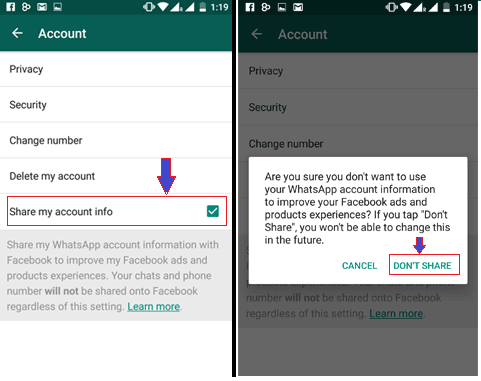 If you are looking for how to prevent Whatsapp to share your data with Facebook, in this article you will get complete solution to do so. Go to the phone menu, find Whatsapp icon and make a tap on it. If you are having an Android, find action overflow option at the upper right corner and click on it. But if you’re an iOS user then go to the lower right corner and click on setting tab. Click on the marked check box and find the right to Share my account info option. By clicking on don’t share options a pop-up appears which describes that if you click on the option, you will not be able to alter this in future. If you agree with the terms and follow the action, the popup won’t appear on your screen again. After this, your account details, shared information and application usage will not be shared with Facebook again. Hope this guide would be relevant for you and prevent to share your Whatsapp information on Facebook.